Size: Colonies may be 2 feet in diameter, but more commonly 1 foot in diameter or less. Individual zooids are microscopic, can be as small as a couple millimeters. Description: Bryozoans, or "Moss Animals", are a very unique group of animals. So unique in fact, that they are often not recognized as animals to the untrained eye. Bryozoans are sessile, colonial invertebrates. This means they live in large groups that permanently attach to hard underwater surfaces. In that regard, they are kind of like coral but are much more complex organisms. Each individual organism in the colony is called a zooid. The many species of bryozoa lead to the many different shapes and styles of the underwater colonies. One of the most commonly observed species in New Jersey is Pectinatella magnifica. 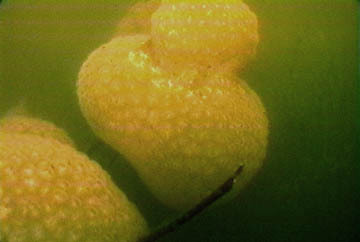 This species can often be found growing on underwater brush or other woody structure in what appears to be a large, gelatinous mass. Habitat: Most common in warm, fertile lakes and ponds or very slow moving rivers. Food: Bryozoa use a crown of tiny ciliated tentacles, called the lophophore, to create currents and then filter out microscopic plankton such as algae. Life Cycle: Most bryozoa are hermaphroditic, meaning each zooid has both male and female organs. Sexual reproduction, where a sperm cell fertilizes an egg, occurs only in a single brief period each year. After fertilization, a free-swimming larva is formed composed of two zooids. The larva may be free-swimming for only a few minutes up to about 24 hours. When it contacts suitable substrate, it settles and becomes permanently attached, the zooids begin feeding and will eventually form a new colony by asexual reproduction called budding . This is simply a process whereby an entirely new organism buds or grows from another. The new organism is a genetic clone of the parent. The bryozoan colony disintegrates as the water starts to cool in the fall. The statoblasts are released and become new colonies in the spring. Ecological Role: The constant flow of water around bryozoan colonies created by the millions of tiny beating tentacles provides favorable habitat for many other types of freshwater invertebrates. Flatworms, oligochaete worms, snails, mites and insect larvae such as caddisflies and midges often feed on the zooids of the bryozoan colony. Fun Facts: Freshwater bryozoans can reproduce sexually and also asexually by budding or forming tiny structures called statoblasts . Statoblasts are dormant multi-cellular clones of the adult. They are very resistant to drying and extreme temperatures and are equipped with tiny hooks that aid in dispersal. When the statoblast encounters suitable habitat it germinates into a new zooid, which then buds 1-5 new zooids and so on forming, forming a new colony. The different distinctive structure of statoblasts produced by various species are very important for identification purposes. There are about 50 described species of freshwater bryozoans in the world.